The Best Gifts For Hikers: Make Them Smile! 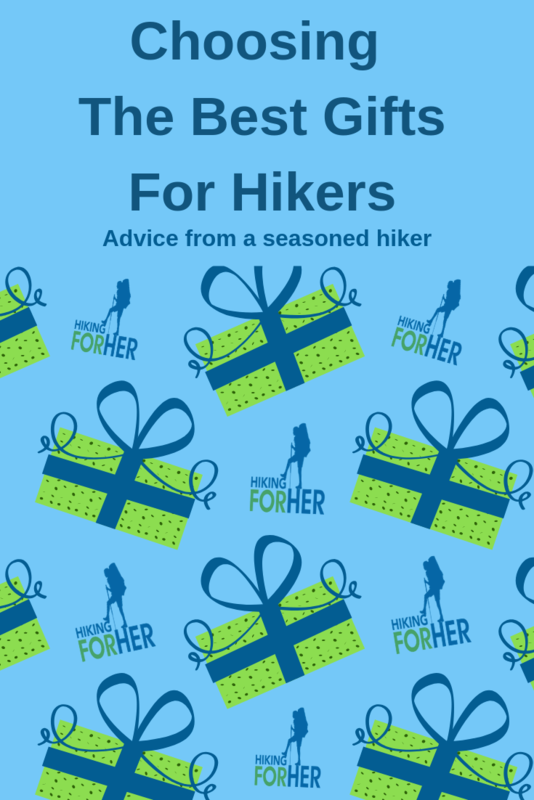 If you're faced with the task of selecting the very best gifts for hikers in your family or circle of friends, you might need a bit of advice from a seasoned hiker. What to get a hiker for Christmas or any other holiday or special occasion can be a daunting question. Consider me ready and willing for the task! I've been on the giving, and the receiving, end of hiking gifts for decades of birthdays and holidays. Unique hiking gift recommendations are my specialty! Is selecting presents for hikers, male or female, any different than for other folks celebrating a special day or milestone? Except that hikers have very specific needs. And they may be a little picky about the quality and durability of their trail gear. Not to mention color and performance of survival gear like a backpacking tent or hiking boots. So if you're not a hiker yourself, how are you going to know which choices make the best presents for the hikers in your life? Excellent question, and it's why you're on this page. In today's electronic marketplace, it's easy to point and click. Whoosh! A new pair of boots arrives within a few short days. But are they the right boots? Will they hold up for miles and years to come, without creating blisters or falling apart at the seams? Did you get the best price and the highest quality? So before you hit the "go" button, do a little research first. Some gear and brand names are definitely worth a little extra money. Some gear is overpriced because it has a particular brand name on it, and the company expects you to pay for that name without looking closely at the quality of the hiking gear. And then there's the "everyone has it" pressure to purchase. You want your gift to be exactly the right balance: functional and long lasting while being fairly priced. Read this about reliable hiking gear sources. Here's a great place to focus on the balance between quality and cost when searching for the best gifts for hikers: my gear list. And if you need an inexpensive hiking gift ($25 or less) that is still trail worthy, start here. Coming right up on this page: a list of the best gifts for hikers. Some of these links are affiliate links. 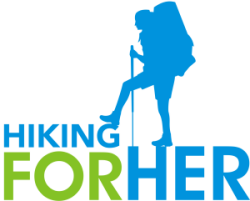 Hiking For Her will receive a small percentage of your purchase price, but you pay nothing extra. Finding the best gifts for hikers is all about balance, right? the sexiest gift of all: hiking socks! But selecting fun and useful gifts for women hikers can be a bit more complicated once you veer off the obvious gear list. There are so many websites, so many outdoor stores, and a huge range of quality - where should we start? Why not with a hand picked "Top Hiking Gifts" list? I'm willing to bet you a sack of trail snacks that you will find at least one intriguing idea here in your quest for hiking gifts for your favorite hiker. And if you've got "hikers-in-training" to shop for, be sure to check out this list. I raised 2 kids, and feel confident that my suggestions will be sure to appeal to your favorite hiking kids. Consider this: you can order a Cairn outdoor subscription box delivered to your hiker, and neither one of you will know exactly what it contains until she opens it! This may be one of the very best gifts for hikers ever invented, because we all love to surprise, and to be surprised. And if you don't like any of my suggestions, you can contact me for some individualized suggestions (see bottom of page). How's that for helping you track down the best gifts for the hikers in your life? 1. Hike like a girl in a hiking skirt. There are many, many reasons for wearing hiking skirts on the trail and on extended outdoor adventures. Not a skort - that has built in shorts that can bunch up and chafe her skin. I'm recommending a real skirt. Be careful about fabrics. You want to avoid cotton, which can make her body temperature plummet if she gets wet on the trail. Look for fast drying fabrics such as polyester and nylon, with a bit of spandex to provide shape and allow free movement. Which hiking skirt you select for her depends on which type of hiking she's doing. Here are two "best gifts for hikers" suggestions in the clothing category, from a company that has been around a long time and understands women's outdoor clothing needs. 2. Trail journal: This is a unique gift for a hiker, with the added bonus of being a very useful gift. Read about seven ways to use a trail journal here. What is it about the rhythm of a hiking trail that brings great ideas to mind? I'm not sure, but I know this is one of the best gifts for hikers, and will be treasured on cold winter days when she can revisit her summer hikes. 3. Gift certificates: There are some who say that gift certificates are lame gifts for women hikers. I'm here to tell you that I LOVE getting them. A gift card is the perfect excuse to wander through the store (virtual or bricks & mortar), spending the money 15 different ways until I decide what I'd really like to take home. A new trail toy that I get to pick out as a gift is such a treat. REI is a gear store that has a generous return and exchange policy, and carries only high quality, trail tested gear. If you go along with her on a few hikes, you'll get ideas on the best hiking gifts for next time. Then you don't have to resort to a "lame" gift certificate for her birthday. But I'm betting that once she receives one, she'll ask for more gift certificates! 4. BPA-free water bottle: I'm a fan of metal water bottles, but you don't have to "go metal" to get away from toxic plastics. There are zillions of choices, some which come with their own waist/fanny packs. Finding the best gifts for hikers couldn't be easier! Just pick out her favorite color and size, and wrap it up. For my specific recommendations on hiking water bottles that work great and go the distance, go here. And if you want to customize the colors on a hiking water bottle, HydroFlasks are the way to go! Pick her favorite team colors. You can literally choose different colors for the top, middle, and bottom of these bottles! How cool is that? 5. Trail snack bag: This one takes a little leg work. Fill a sack with any of these Hiking For Her recommended yummy trail snacks. She will appreciate your thoughtfulness! And you can tailor your selection of snacks to any food preferences or intolerances (gluten free, for example) that she has. You don't have to tell her how much fun it was to spend time in the healthy snack section of your local store! Who knew selecting best gifts for hikers could be so easy? 6. A hiking stick: If she doesn't already use hiking poles (sticks, staff, trekking poles, whatever these are called in your neck of the woods), here's a great gift. Poles are designed to take a load off the hard working knees of a hiker, and give additional stability when navigating tricky footing (that link above gives you all of the details, and my recommendations). telescoping down to a really small footprint in her pack? a medallion to commemorate her favorite spot? As with a journal, this gift can last a lifetime and be passed down in the family if you buy high quality trekking poles. Sometimes the best gifts for hikers solve problems encountered routinely during backpacking trips. Titanium cooking sets are incredibly lightweight and perform well under all temperature conditions in backcountry conditions. Who wouldn't love these? And they can be used for car camping, too. Don't forget to throw in a few sporks! And here's a thoughtful gift: a camp kitchen solar powered lighting option. If you want to go deeply into the art of creating a camping or backpacking kitchen, here are all the tips you need. 8. How about choosing headwear that can double as a neck gaiter? Hiking hats can express your hiker's personality through color, style and logos. Read my review here of a fun fashion statement that works hard on the trail. I never take a hike without mine. Never overlook the value of traditional bandannas... useful for so many, many problems a female hiker will run up against on the trail. Tip: A fun way to make a bunch of bandannas into a creative hiking gift is to wrap up trail snacks in each bandanna and tuck them all into a new pack. 9. I'm sure you were expecting to read about jewelry, given that females and baubles seem to go together. Here's an artist who has some beautiful offerings that might be just what your favorite hiker would love to wear. Being a female on the trail presents its own set of challenges, and rewards. One of the biggest challenges is answering nature's call when there is no rock or tree to hide behind. Here's a creative solution: pee standing up! Lots of other advice on dealing with body fluids, too. If you'd like to put together a complete hiking hygiene kit (what a fantastic gift! ), here are some suggestions. The best gifts, hiking or otherwise, demonstrate the thoughtfulness of you, the giver. 1. Books about hiking abound, but you can get really creative by picking a themed selection of hiking books: one of her "bucket list" destinations, or tales by adventurous outdoor women. For example, does she love alpine flowers? For a long list of Hiking For Her recommendations, go here. Want all of the best Hiking For Her tips for dayhiking collected in one spot? Here's the book for you need. For a truly memorable gift, load up an e-reader for your hiker. Read about Kindle hiking here. 2. The gift of time: OK, it's corny. But I remember craving trail time in my 30's and 40's, trying to juggle kids, jobs, house chores. So if you can, offer to babysit, or drive her to/from the trail head, or take over her chore list to allow her to slip away for a refreshing, soul satisfying hike. 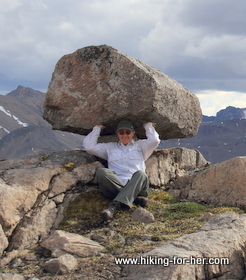 She will be very grateful that you offered her one of the best gifts for hikers imaginable. 3. Swedish massage gift certificate: Here I go with the gift certificates again. But believe me, she will NOT think this is lame. Be sure to request extra work on the feet and legs for your women hikers! If you want to go down in the "giver of best gifts for hikers" hall of fame, why not pay for a series of massages during her peak hiking season(s)? How about paying for an exercise or strength/conditioning class for your favorite hiking woman? Every hiker has her own little twists on hiking. Is she into nutrition? Even more specifically, is she gluten free? A solo hikers? Planning a backpacking trip? Check out these hiking nutrition e-booklets. Would she enjoy her very own bench marker? For a gift that keeps on giving for at least a year, consider a hand picked hiking magazine. Or help her find an ideal hiking partner, using the Hike With Me process developed right here at Hiking For Her. 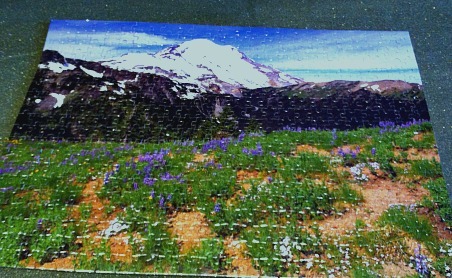 Here's one of the best hiking gifts I've ever received: a puzzle using a photo of a favorite hiking destination. I put mine together (a thoughtful gift from my husband) every winter, to remind myself of that great hiking trip to a "secret" viewpoint of Mount Rainier. Put together a trailhead kit, and get ready for a huge smile of delight from your hiker. Make it a Trail Tea Kit: a JetBoil for boiling water in 2 minutes, a thermos she can fill up and take with, or a durable cup for enjoying a hot beverage after her hike. Include some great black tea, green tea or herbal tea choices! Of course, this works for coffee drinkers, too. Bottled water with electrolytes, tasty complex carbohydrates (see trail snacks above) to rebuild her glycogen stores, and some unscented baby wipes to wipe off the sweat. Completely stumped for best hiking gift ideas for the hikers in your life? and anything else about her that makes her unique in your eyes. I'll give you a few "best gifts for hikers" ideas to make her eyes light up! After all, the best gifts for hikers keep her safe and happy on any trail, and that's what Hiking For Her is all about! And while you're thinking of it, check out the best hiking gear for your next round of gift giving. Some of the links on this website are affiliate links: you pay nothing extra while Hiking For Her receives a small percentage of your purchase price when you use the links. Nothing on this website is here by accident. Only the best of the best hiking recommendations make it!